Your dorm desk should have as much high impact dorm room decorations as the rest of your college dorm room. You don't want to focus on the rest of your dorm room decor and kind of ignore your dorm desk. Your dorm desk needs to look as great as the rest of your dorm room and it needs to be as organized. You'll be spending a lot of time sitting at your college dorm desk, after all. 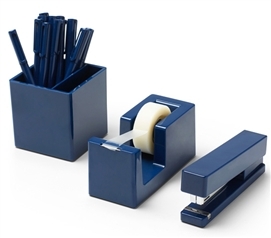 Here you will find our Navy Colorful Desktop Supplies to give your dorm desk the boost of dorm decor and organization it needs. You don't want your college dorm desk to become a mess in the first week of college. You need your dorm desk to stay organized so that it not only adds to your dorm room decor, but it makes studying easier and more efficient so you don't have to search for study supplies that you need. Keep your dorm desk looking as snazzy as the rest of your college dorm room with dorm supplies that add to your dorm decor while keeping you organized with our Navy Colorful Desktop Supplies.